BROWARD COUNTY, FL - Broward County, Florida, has transferred ownership of approximately 60 acres of wetlands habitat at Port Everglades, including a successful 16.5-acre Wetland Enhancement project, to the State of Florida for its permanent protection as a conservation area. In addition, the State is developing a memorandum of understanding with the South Florida Audubon Society to manage the conservation area. The land transfer completes a critical component of the Port Everglades Southport Turning Notch Extension project that will increase berth space for cargo ships at the berth-constrained seaport. "This project is proof that Port Everglades can develop and expand its maritime facilities to meet current and future market demands while enhancing and protecting the critical environmental habitat within the port," said Port Everglades Chief Executive and Port Director Steven Cernak. 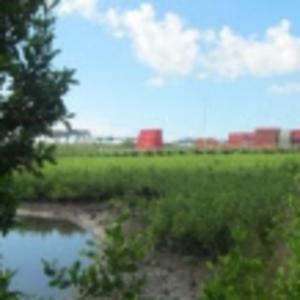 "Port staff worked closely with port users, the environmental community, especially the South Florida Audubon Society, and the Florida Department of Environmental Protection (FDEP), to develop a new mangrove habitat that significantly increases the amount of mangrove conservation area in a more environmentally advantageous location within the port." Over the past two years, Port Everglades developed a wetlands habitat and cultivated approximately 70,000 Florida-native, nursery-grown mangroves and other wetland plants to create 16.5 acres of habitat on property that was originally a dry-stack marina and parking lot. Completion of this transfer allows 8.7 acres of an existing mangrove area to be removed and included in the Southport Turning Notch Extension project, making way for up to five new cargo ship berths. The Port&apos;s 16.5-acre Wetland Enhancement Project restores and creates mangrove wetlands, and has been added to an existing conservation area to provide additional sustainable habitat for a diverse number of aquatic species as well as nesting habitat for birds. "The South Florida Audubon Society is very excited to be part of this symbiotic relationship between a highly urbanized environment and a conservation easement. We are very pleased with the results to date and look forward to educating the public about this very sensitive environmental area," said Doug Young, Chief Operating Officer, South Florida Audubon Society. The Southport Turning Notch Extension to add new berth space for cargo ships is projected to create 2,227 construction jobs in the near term and provide a $10.7 billion annual increase in economic activity and 5,529 regional jobs related to Port Everglades by 2030 when it is expected to be fully utilized at its maximum capacity. The Southport Turning Notch Extension is being funded through Florida Department of Transportation grants and port user fees. No local property taxes will be used for this project because Port Everglades is a self-funded enterprise of Broward County. DeRose Design Consulting designed the habitat, which was completed in July of 2015. The Port Everglades Department&apos;s Seaport Engineering and Construction Division managed the project. Earth Balance Corporation grew 100,000 mangrove seedlings (some as reserves) at two different nurseries within the state while the site work was completed. Bergeron Land Development, Inc. was the construction manager for the $15.8 million project. The Wetland Enhancement Project won IHS Maritime and Trade magazine&apos;s 2016 Dredging and Port Construction Innovation Award in the "Working/Engineering/Building with Nature Award" category. According to IHS, the "Nature category winner demonstrates an active and innovative response to the preservation and promotion of the following areas: wildlife, reduction in air emissions, water quality, treatment of soils/sediments, community engagement and sustainability." As one of Florida&apos;s leading economic powerhouses, Broward County&apos;s Port Everglades is the gateway for international trade and cruise vacations. Consistently ranked among the top three busiest cruise ports in the world, Port Everglades is also one of the nation&apos;s leading container ports and South Florida&apos;s main seaport for receiving petroleum products including gasoline, jet fuel and alternative fuels. The total value of economic activity related to Port Everglades is nearly $30 billion. More than 222,000 Florida jobs are impacted by the Port, including almost 13,000 people who work for companies that provide direct services to Port Everglades. For more information on Port Everglades, go to porteverglades.net or e-mail PortEverglades@broward.org.